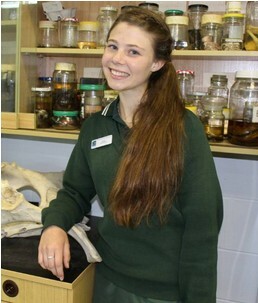 Last Wednesday 4th November, Jade Moxey won the major NSW science award as ‘Young Scientist of the Year’ for her research into the spread of invasive weeds in rural areas. 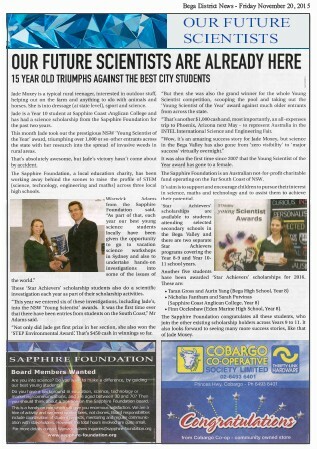 Jade is a Year 10 student at the Sapphire Coast Anglican College. As well as her prize money of $1500 Jade will also be going to Phoenix (Arizona) next May to represent Australia in the Intel ‘International Science and Engineering Fair’. It is the first year that any local student has entered this competition, which makes her win doubly awesome. (It is also the first time since 2007 that a female has won the ‘Young Scientist of the Year’ award).